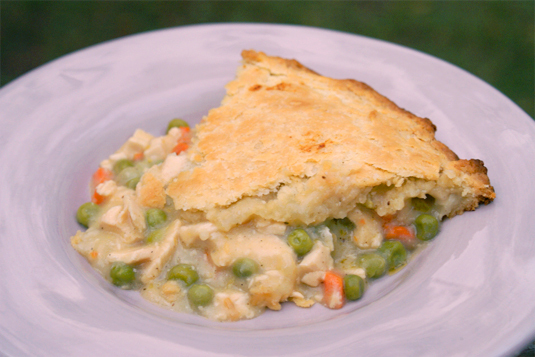 I started making this Chicken Pot Pie a few years ago when my husband asked me why I didn't buy him the little individual frozen pot pies. I don't buy them because, frankly, I don't like 'em. 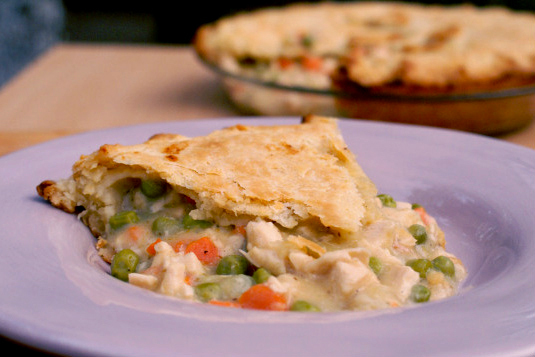 Not that I don't like pot pie, I'm just not a fan of frozen meals, in general. I bet if you try my pot pie, you won't buy the frozen ones either. I often send my husband to work with dinner leftovers for his lunch. Well, there was one time when I sent him with this pie and the guys he works with were pretty jealous that I make him pot pie from scratch. They said they'd pay good money for a homemade chicken pot pie. Now, there's an idea! Becky the pie lady? Hmmmm...maybe there's a business venture in my future! I'm sure you'll find this to be a 'stick to your ribs', 'warm you up on a cold night', man-pleasing meal. *If you are short on time, substitute the above ingredients with 2 (9 inch) pre-made unbaked pie crusts and skip to step 4 . 1. 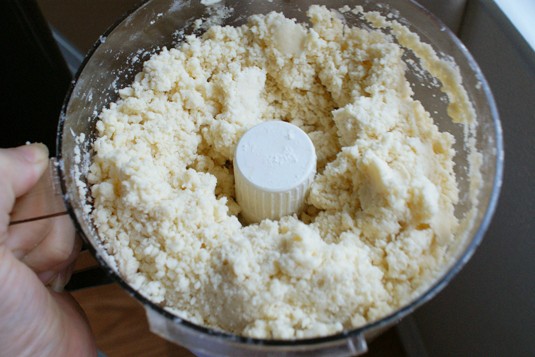 In a food processor pulse together the flour, salt and sugar. 3. 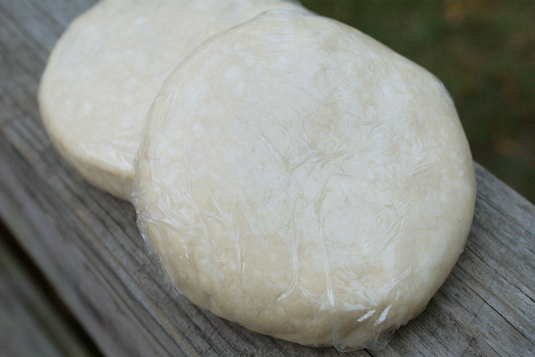 Halve the dough and and wrap in plastic wrap, pressing into disks. (Handle the dough as little as possible during this step.) Chill the dough for at least one hour. 4. Meanwhile, in a large pan, saute the chicken in vegetable oil over medium high heat until cooked through and no longer pink. Remove the chicken from the pan. 5. Reduce the heat to medium and add the butter to the pan. Add the carrots, onions and celery and saute until soft, about five minutes. 6. Add the flour, salt, pepper, celery seed and poultry seasoning to the pan and cook for 2-3 minutes, stirring frequently. Slowly add the chicken broth and milk to the pan, stirring constantly. Add the chicken and the peas. Simmer until mixture thickens. Remove from heat. 7. Preheat oven to 425°. 9. Line a pie pan with one of the crusts and add the filling. Cut several slits into the other crust BEFORE topping the pie. Tuck the top crust under the bottom one around the edges and pinch to seal. Bake in preheated oven for 30-35 minutes. (If the edges begin to over-brown, top them loosely with several pieces of foil after about 20 minutes of cooking time.) Cool 10 minutes before serving. 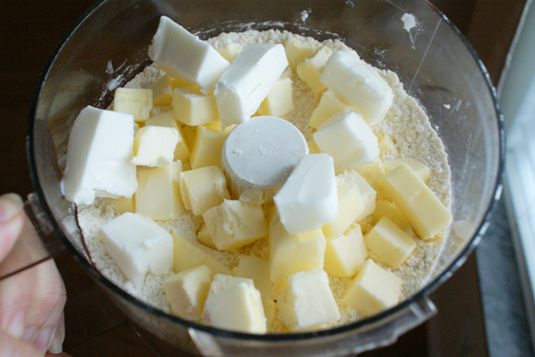 Dough for crusts can be made in advance and frozen for up to 2 months. Thaw for approximately 15 minutes on the counter then roll out. Substitute or add vegetables that you like. Broccoli and potatoes make excellent additions. The pot pie looks delicious! That's the start of a business success story right there! JonathanN: I'm so glad you liked it! The peas are not listed. @Anonymous: I don't know how I missed that! Thanks! I've edited the ingredients to include them. I've been making a similar version of this for years with the same delicious results. Mine is a little easier since I use the frozen peas and carrots (less chopping) and a can of cream of potato soup.